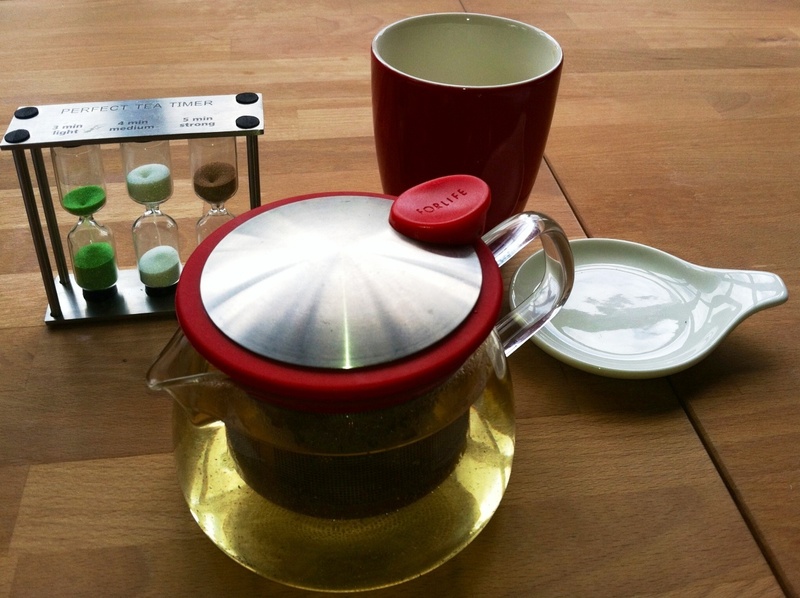 Tea is served with TLC and your personal timer, glass pot with stainless mesh infuser (no plastic here thank you) and thoughtful infuser holder. If you haven’t yet discovered this NW gem, you’ll want to put it on your go to list. Tucked into the charming residential area of NW PDX, KIVA offers tea and a cafe menu to please your palate and spa services to pamper the rest of you. Tea is given top billing here which makes my heart smile and their effort to please tea lovers shines through. From the friendly service to the wall to wall tea selections, this place is a winner. Teas include custom organic loose leaf blends by The Art of Tea of white, green, black, oolong, pu-erh and herbal as well as Ayurvedic inspired. I enjoyed a pot of the White Coconut Creme, a white tea blended with coconut, pineapple, safflowers and cornflowers. Light, lovely and smooth. My friend ordered a pot of the Ayurvedic Happy and she was … I could smell the strawberries across the table. The food menu is extensive with a focus on healthy and portions are generous. If you can’t find something that delights you here … you need serious help. I especially appreciate that you can mix and match items and that smaller “tapas” portions are offered, too, starting at just $2.50. The tab for two pots of fabulous tea (free refills of hot water), 6 slices of toasted rustic bread w/cocoa almond butter and two of the largest dolmas I have ever seen came to $7.50. Throw in the cool vibe, the smiling staff and the friendly chatter and you’ve got a place that keeps em coming back for more. Congrats, KIVA! Visit the KIVA website to see all the teas and menu items as well as spa treatments and group party information.